Market prices didn't make much progress last week, so the environment remains bearish for new positions (i.e. downtrend). Only the Russell 2000 is above the 50-day moving average. Price and volume action remains mixed. Growth stocks are having a hard time staying above technical resistance levels (i.e. buy points in price patterns such as flat bases), even though Q1 earnings have been strong. We see no reason to be concerned unless the SPX loses 2500. Coincidentally, that's a handful of points below the floor of the descending triangle pattern we've been tracking recently. The upper trendline now rests at ~2,680; the floor remains at 2,581. 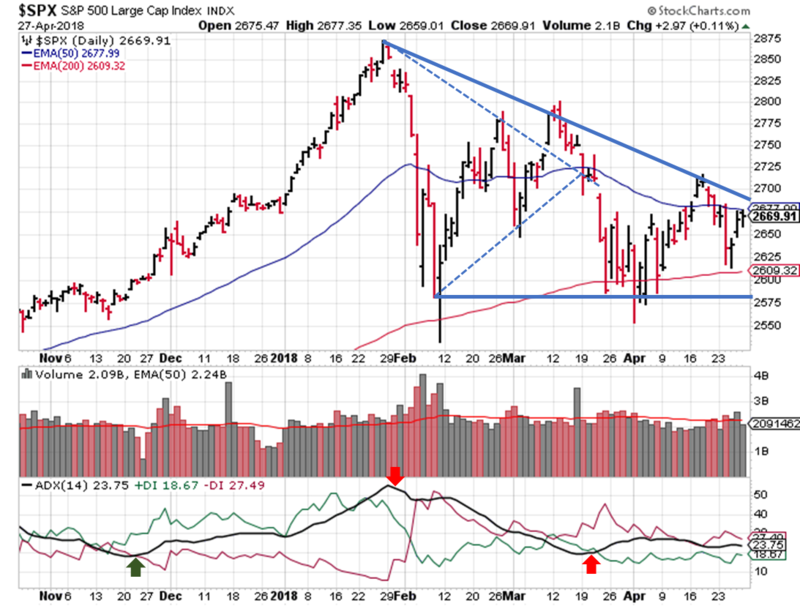 The ADX indicator hasn't changed much in April (still bearish), as the S&P works its way through the descending triangle price pattern. 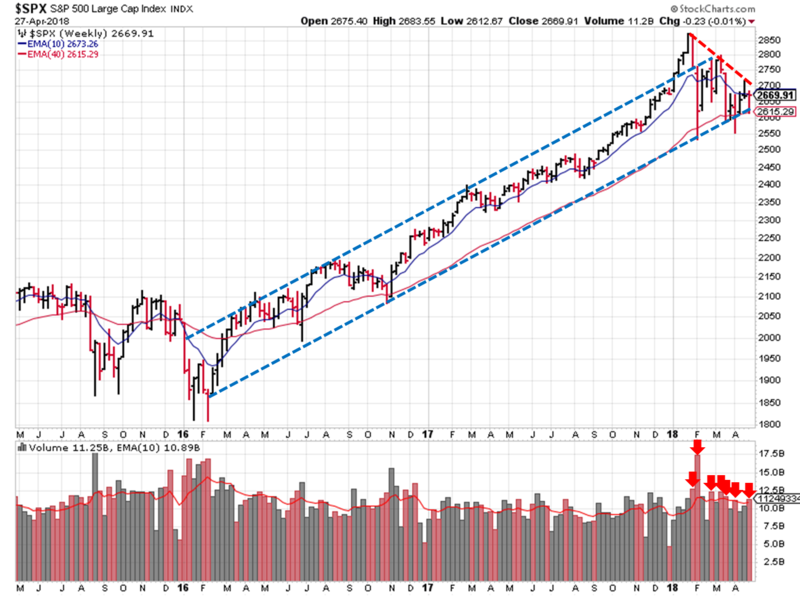 The longer term price channel also remains intact, as we saw a bounce off the lower trendline last week. But the week ended with a loss, and trading volumes were higher than last week. Earnings reports, for the most part, are crushing expectations. You'd think stock prices would react in kind, blasting past resistance levels and other technical sticking points. You'd be wrong. Lot's of after hours/pre-market gap ups, only to be sold off during the trading day. 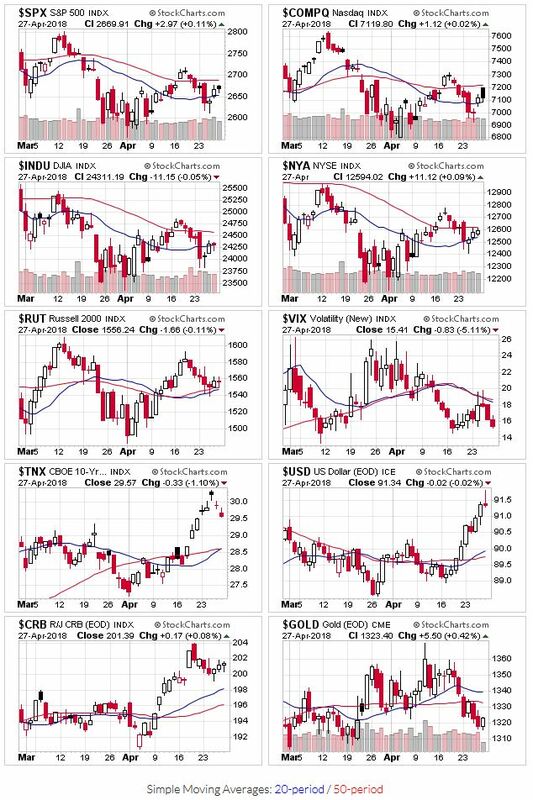 Such is life in a downtrend...which is why it pays to be cautious and avoid initiating new positions until market conditions improve.